2014. 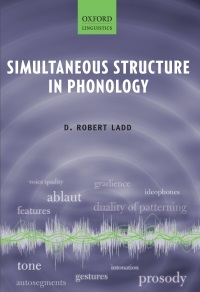 Simultaneous Structure in Phonology. Oxford University Press. 2008. 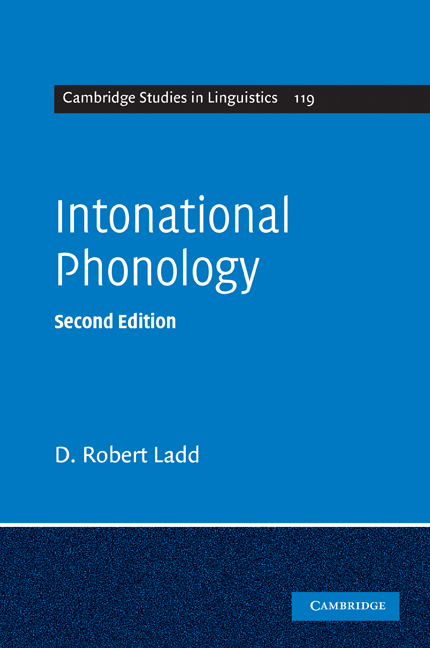 Intonational Phonology, second edition. Cambridge University Press. For online resources including sound files of all examples, click the link, then click "Resources". 1996. Intonational Phonology. Cambridge University Press. 1992. (Co-editors: G. J. Docherty and D. R. Ladd). Papers in Laboratory Phonology II: Gesture, Segment, Prosody. Cambridge University Press. 1983. (Co-editors: A. Cutler and D. R. Ladd). Prosody: Models and Measurements Heidelberg: Springer-Verlag. 1980 The Structure of Intonational Meaning: Evidence from English. Bloomington: Indiana University Press. in press a. Mid-century American phonology: the post-Bloomfieldians. To appear in the Oxford Handbook of the History of Phonology, edited by Elan Dresher and Harry van der Hulst, Oxford University Press. in press b. (Co-authors: D. R. Ladd and J. Kirby). Tone-melody matching in tone language singing. To appear in the Oxford Handbook of Linguistic Prosody, edited by Aoju Chen and Carlos Gussenhoven. in press c. The Trouble with ToBI. To appear in Prosodic Theory and Practice (MIT Press), edited by Stefanie Shattuck-Hufnagel and Jonathan Barnes. 2016a. Commentary: Tone languages and laryngeal precision. Journal of Language Evolution 1: 70-72; published online February 2016, doi: 10.1093/jole/lzv014. Supplementary Materials. 2016b. (Co-authors: J. Kirby and D. R. Ladd). Effects of obstruent voicing on vowel F0: evidence from "true voicing" languages . Journal of the Acoustical Society of America 140: 2400-2411. Published online October 2016, doi: 10.1121/1.4962445 . Available here from Edinburgh Research Explorer. 2016d. (Co-authors: J. Kirby and D. R. Ladd). Tone-melody correspondence in Vietnamese popular song. Paper presented at TAL (Conference on Tonal Aspects of Language), Buffalo NY, May 2016. 2015a. The American four-level analysis of intonation contours: historical postscript. Historiographia Linguistica 42: 119-137. 2015b. (Co-authors: D. R. Ladd, S. G. Roberts, D. Dediu). Correlational studies in typological and historical linguistics. Annual Review of Linguistics, vol. 1, pp. 221-241. An "e-print" is available here. 2015c. (Co-authors, C. Caldwell-Harris, A. Lancaster, D. R. Ladd, D. Dediu, M. Christiansen). Factors influencing sensitivity to tone in an artificial language: Implications for second language learning. Studies in Second Language Acquisition 37: 335-357. 2015d. (Co-authors: P. Bestelmeyer, P. Belin, D. R. Ladd). A neural marker for social bias toward in-group accents. Cerebral Cortex 25: 3953-3961; published online December 2014, doi: 10.1093/cercor/bhu282. 2015e. (Co-authors: A. Arvaniti and D. R. Ladd). Underspecification in intonation revisited: a reply to Xu, Lee, Prom-on and Liu. Phonology 32: 537-541. 2013a. (Co-authors: D. R. Ladd, R. Turnbull, C. Browne, C. Caldwell-Harris, L. Ganushchak, K. Swoboda, V. Woodfield, D. Dediu). Patterns of individual differences in the perception of missing-fundamental tones. Journal of Experimental Psychology: Human Perception and Performance 39: 1386-1397. Available online (subscribers only?) at http://dx.doi.org/10.1037/a0031261. A prepublication version that incorporates the online supplementary materials is here. Sound files of the complete set of stimuli used in the experiment 4 series are here. 2013b. An integrated view of phonetics, phonology, and prosody. In M. Arbib (ed. ), Language, Music, and the Brain: A mysterious relationship (Cambridge MA, MIT Press), pp. 273-287. 2012a. Orthographic reform in Dinka: Some general considerations and a proposal. Discussion document, to be submitted in due course to Occasional Papers in the Study of Sudanese Languages. Re-posted on the general Dinka language and culture blog Piööcku Thuɔŋjäŋ. 2012b. (Co-authors: D. R. Ladd and Lauren Hall-Lew). Commentary on Emma Cohen, 'The evolution of tag-based cooperation in humans: The case for accent'. Current Anthropology, 53: 608. 2012c. What is duality of patterning, anyway?. Language and Cognition 4: 261-273. 2011. Phonetics in phonology. In J. Goldsmith, J. Riggle, and A. Yu (eds. ), Handbook of Phonological Theory (second edition), Blackwell, pp. 348-373. For many of these papers a pdf of the final submitted typescript (or a link to an open-access published version) is made available here for private use. Citations and direct quotes should always be based on the published version. 2009b. (Co-authors: Amalia Arvaniti and D. R. Ladd). Greek wh-questions and the phonology of intonation. Phonology 26: 43-74. 2009c. (Co-authors: D. R. Ladd, Bert Remijsen, and Caguor Adong Manyang). On the distinction between regular and irregular inflectional morphology: evidence from Dinka. Language 85: 659-670. 2008a. (Co-authors: D. R. Ladd, Dan Dediu, and Anna R. Kinsella). Languages and genes: Reflections on biolinguistics and the nature-nurture question. Biolinguistics 2: 114-126. 2008c. (Co-authors: Bert Remijsen and D. R. Ladd). The tone system of the Luanyjang dialect of Dinka. Journal of African Languages and Linguistics 29: 173-213. 2008d. (Co-authors: Nikolaus Himmelmann and D. R. Ladd). Prosodic description: An introduction for fieldworkers. Language Documentation and Conservation 2: 244-274. 2007a. (Co-authors: Dan Dediu and D. Robert Ladd). Linguistic tone is related to the population frequency of the adaptive haplogroups of two brain size genes, ASPM and Microcephalin. Proceedings of the National Academy of Sciences 104: 10944-10949. Online reference dx.doi.org/10.1073/pnas.0610848104. Additional Information. 2007b. (Co-authors: Jennifer Pope, Miriam Meyerhoff and D. Robert Ladd). Forty years of language change on Martha's Vineyard. Language 83: 615-627. 2006a. (Co-authors: A. Schepman, R.Lickley and D. R. Ladd). Effects of vowel length and "right context" on the alignment of Dutch nuclear accents. Journal of Phonetics 34: 1-28. 2006b. (Co-Authors: Amalia Arvaniti, D. R. Ladd, and Ineke Mennen). Effects of focus and "tonal crowding" in intonation: Evidence from Greek polar questions. Speech Communication 48: 667-696. 2006c. "Distinctive phones" in surface representation. In L. Goldstein, D. Whalen, C. Best (eds.) Laboratory Phonology 8, Berlin: de Gruyter, pp. 3-26. 2006d. (Co-Authors: Amalia Arvaniti, D. R. Ladd, and Ineke Mennen). Tonal association and tonal alignment: Evidence from Greek polar questions and contrastive statements. Language and Speech 49: 421-450. 2005. (Co-authors: R. Lickley, A. Schepman and D. R. Ladd). Alignment of "phrase accent" lows in Dutch falling-rising questions: Theoretical and methodological implications. Language and Speech 48: 157-183. 2004. (Co-authors: M. Atterer and D. R. Ladd). On the phonetics and phonology of "segmental anchoring" of F0: Evidence from German. Journal of Phonetics 32, 177-197. 2003a. (Co-authors: D. R. Ladd and A. Schepman). "Sagging transitions" between high accent peaks in English: experimental evidence. Journal of Phonetics 31: 81-112. 2003b. (Co-authors: D. R. Ladd and J. M. Scobbie). External sandhi as gestural overlap? Counter-evidence from Sardinian. In Local et al. (eds), Papers in Laboratory Phonology VI, Cambridge University Press, pp. 164-182. 2001. Intonation. In Language Typology and Language Universals: An International Handbook (M. Haspelmath, E. König, W. Oesterreicher, W. Raible, eds. ), Mouton de Gruyter, pp. 1380-1390. 2000a. (Co-authors: J. Pierrehumbert, M. E. Beckman, D. R. Ladd). Conceptual foundations of phonology as a laboratory science . In N. Burton-Roberts, P. Carr, G. J. Docherty (eds. ), Conceptual and Empirical Foundations of Phonology, Oxford University Press, pp. 273-303. Reprinted 2012 in A.Cohn, C. Fougeron, M. Huffman (eds.) The Oxford Handbook of Laboratory Phonology , Oxford University Press, pp. 17-39. 2000b. (Co-authors: D. R. Ladd, I. Mennen, A. Schepman). Phonological conditioning of peak alignment of rising pitch accents in Dutch. Journal of the Acoustical Society of America 107: 2685-2696. 2000c. (Co-authors: M. Grice, D. R. Ladd, A. Arvaniti). On the place of phrase accents in intonational phonology. Phonology 17: 143-186. 1999. (Co-authors: D. R. Ladd, D. Faulkner, H. Faulkner, A. Schepman) Constant "segmental anchoring" of F0 movements under changes in speech rate. Journal of the Acoustical Society of America 106: 1543-1554. 1998. (Co-Authors: A. Arvaniti, D. R. Ladd, and I. Mennen). Stability of tonal alignment: the case of Greek prenuclear accents. Journal of Phonetics 26: 3-25. For many of these older papers there is no suitable electronic source for creating a pdf. Where possible I am working (slowly) to make scanned versions available. 1997. (Co-Authors: D. R. Ladd and R. Morton). The perception of intonational emphasis: Continuous or categorical? Journal of Phonetics 25: 313-342. 1994. (Co-Authors: D. R. Ladd, J. Verhoeven, K. Jacobs). Influence of adjacent pitch accents on each other's perceived prominence: Two contradictory effects. Journal of Phonetics 22: 87-99. 1993a. On the theoretical status of "the baseline" in modelling intonation. Language and Speech 36: 435-451. 1993b. Constraints on the gradient variability of pitch range (or) Pitch level 4 lives! In Papers in Laboratory Phonology III (P. Keating, ed. ), Cambridge University Press, pp. 43-63. 1990a. Metrical representation of pitch register. In Papers in Laboratory Phonology I: Between the Grammar and Physics of Speech (J. Kingston and M. Beckman, eds. ), Cambridge University Press, pp. 35-57. 1990b. (Co-authors: B. Connell and D. R. Ladd). Aspects of pitch realisation in Yoruba. Phonology 7: 1-29. 1988. Declination "reset" and the hierarchical organization of utterances. Journal of the Acoustical Society of America 84: 530-544. 1986. Intonational phrasing: The case for recursive prosodic structure. Phonology Yearbook 3: 311-340. 1985. (Co-authors: D. R. Ladd, K. Silverman, F. Tolkmitt, G. Bergmann, and K. R. Scherer). Evidence for the independent function of intonation contour type, voice quality, and F0 range in signalling speaker affect. Journal of the Acoustical Society of America 78: 435-444. 1984a. Declination: A review and some hypotheses. Phonology Yearbook 1: 53-74. 1984b. (Co-authors: D. R. Ladd and K. Silverman). Vowel intrinsic pitch in connected speech. Phonetica 41: 31-40. 1984c. (Co-authors: K. R. Scherer, D. R. Ladd, and K. Silverman). Vocal cues to speaker affect: Testing two models. Journal of the Acoustical Society of America 76: 1346-1356. 1983a. Phonological features of intonational peaks. Language 59: 721-759. 1983b. Even, focus, and normal stress. Journal of Semantics 2: 54-67. 1981. A first look at the semantics and pragmatics of negative questions and tag questions. Proceedings of Chicago Linguistics Society (CLS) vol. 17, pp. 164-171. 1980. English compound stress. Proceedings of the Eleventh Meeting of the Northeast Linguistic Society (NELS 11). Reprinted in D. Gibbon and H. Richter (eds. ), Intonation, Accent, and Rhythm (Berlin, de Gruyter, 1984), pp. 253-266. 1978. Stylized intonation. Language 54: 517-540. As will be clear from their informal style, approximate references, and so on, these talks are posted here in essentially the form in which they were delivered. This should be taken into account by anyone citing them, and ideally they should not be quoted verbatim. 2011-14x.Individual differences in pitch perception, and their possible relevance for language typology. One version of a paper presented to various audiences, including the 27th Annual Meeting of the Phonetic Society of Japan in Kanazawa in September 2013. 2012-13x. Singing in tone languages: phonetic and structural effects. One version of a paper presented to various audiences, including the 27th Annual Meeting of the Phonetic Society of Japan in Kanazawa in September 2013. 2008x. Phonological equivalence of pitch level in speech. Paper presented at a conference at Tufts University in July 2008 on the occasion of the 25th anniversary of the publication of Lerdahl and Jackendoff's Generative Theory of Tonal Music. 2007x. Alignment of tonal targets: 30 years on. Paper presented at a symposium in honour of Gösta Bruce's 60th birthday in Lund, January 2007. Posted here following Gösta's death in June 2010.